Compared with the planet's other large tracts of tropical forests, the forests in the Democratic Republic of Congo (DRC) have remained relatively intact — though that may soon be changing. Driven by factors such as shifting cultivation (slash-and-burn agriculture), fuelwood demand, logging, mining, infrastructure development, population growth and migration, rates of forest loss in the African country have doubled over the past 15 years. 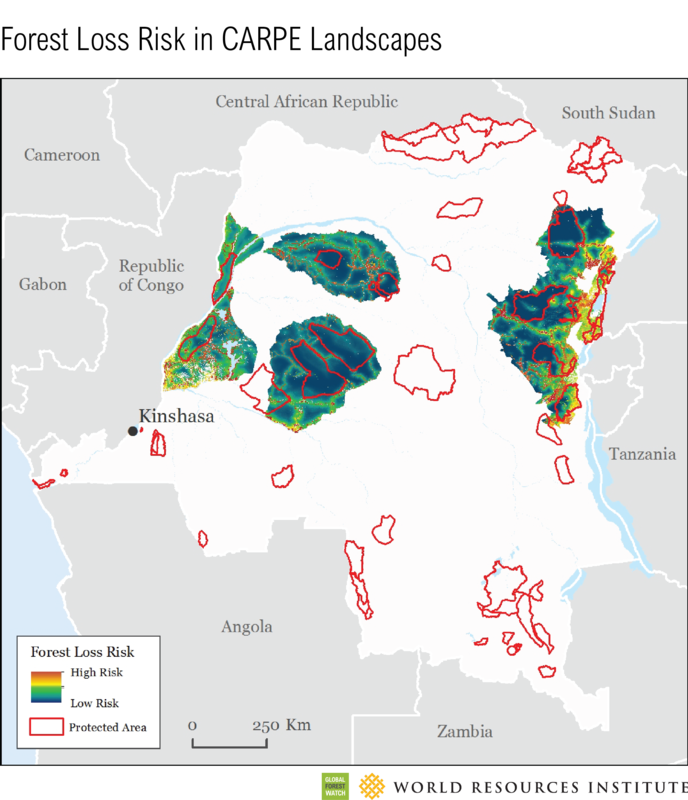 New WRI spatial modeling research sheds light on the uncertain future of the DRC's forests. Based on an application of machine learning, the study focuses on a specific set of the DRC's most intact forested areas identified as containing critical biodiversity habitat; it predicts that without intervention, at least 332,200 hectares (820,884 acres) of these critical forests could be lost by 2025. The collective size of this predicted forest loss — an area the size of Luxembourg within a country the size of Western Europe — may be small, yet millions of people rely on these forests for food, shelter and medicine. This underscores an urgent need to use this study to inform smart land-use decisions in the DRC. Within the DRC, our research focuses on the landscapes prioritized by the Central Africa Regional Program for the Environment (CARPE), a U.S. Agency for International Development (USAID)-funded program implemented by WRI and other partners. As the program was established to maintain the forests and biodiversity of the Congo Basin, its six DRC landscapes were chosen because they contain forests that are important for biodiversity, as well as the livelihoods of millions of people. They also include a range of land-use types such as settlements, zones for extracting timber and minerals, areas of subsistence agriculture and protected areas. This study used spatial modeling software and an artificial neural network architecture, based on the functions of a human brain, to map the links between past forest loss and its drivers in these landscapes, whether tied to biophysical factors (elevation, slope and precipitation), accessibility (distance from roads, settlements, rivers, conflict and shifting cultivation) or land management (forest concession and protected areas). As it's fed data on how landscapes have changed over the past, the model 'learns' and adapts until it arrives at the most accurate linkages between past loss and drivers. The model then ranks the influence of various forest loss drivers in the CARPE landscapes and produces a map showing areas at high risk for forest loss. What Major Factors Influenced Forest Loss? Model results show that human presence has had a significant influence on forest loss in the landscapes. Presence of shifting cultivation — a common land-use practice in the region, as most people rely on subsistence farming to feed their families — had the highest influence on predicting forest loss. Distance from roads was also significant, allowing access into forests that would otherwise be too remote and difficult to traverse for fuelwood and timber extraction. Average precipitation levels had an important influence on forest loss as well, likely due to their effect on agriculture and the probability of forest fires. The majority of loss is expected to occur in the Ituri-Epulu-Aru (34 percent) and Lac-Télé-Lac Tumba (25 percent) landscapes, with loss concentrating near farmland, along roads and near settlements in all landscapes. In some landscapes, protected areas are particularly vulnerable; for example, protected areas within Salonga-Lukenie-Sankuru and Lac Télé-Lac Tumba landscapes are projected to lose 11,700 hectares (28,911 acres) of forest. The government of the DRC is currently pursuing an ambitious program of land use planning reform as part of its national REDD+ process. The country has also made important commitments in the forest sector to set aside 17 percent of forest area as protected, reduce deforestation and restore 8 million hectares of forest land (19.8 million acres). 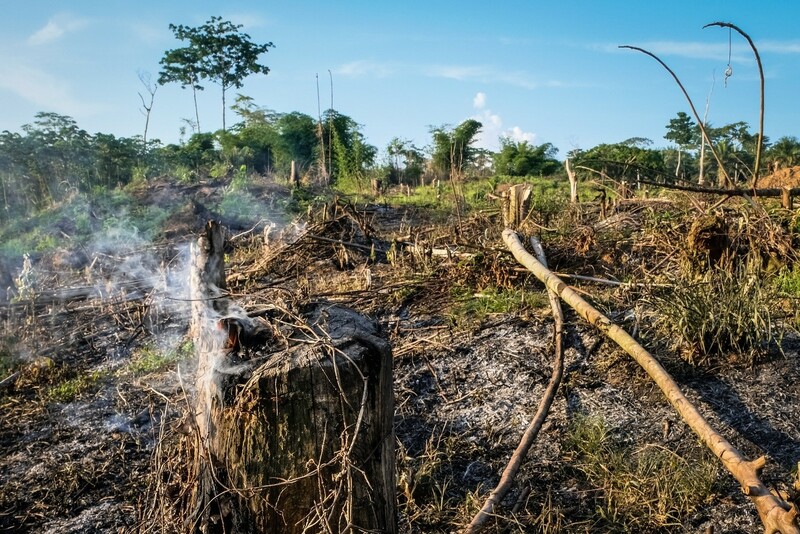 With information about the drivers of deforestation in hand, authorities can proactively make land-use decisions that shift development pressure away from high-value forests and identify opportunities to restore degraded land to address the food and energy needs of a growing population. By revealing where future forest loss is most likely to occur, our research can inform land-use decisions and prioritize conservation efforts. The impact of future roads, settlements or other infrastructure changes can be assessed to reduce forest loss, particularly in protected or other high-value areas. And by seeing where pressure on forests is likely to shift due to increased protection in one area, decision-makers can also better understand the implications of conservation efforts such as increased law enforcement, new protected areas or expanding community forest management. In the DRC, WRI is working with the government, NGOs and civil society partners to ensure that development of new land-use policies and plans integrate high-quality information on forests and biodiversity, including spatial models and scenarios. As part of these efforts, we will continue to build capacity of decision-makers, including provincial authorities and park managers, to understand and implement the findings of this study. Its results should inform a decision-making framework that ensures that land is developed in a way that considers economic, social and environmental impacts. Spatial data and scenario planning must be integrated with land-use decisions — and donors must support the creation of the spatial data infrastructure needed to make this possible. The Central Africa Regional Program for the Environment (CARPE) is administered by the U.S. Agency for International Development. 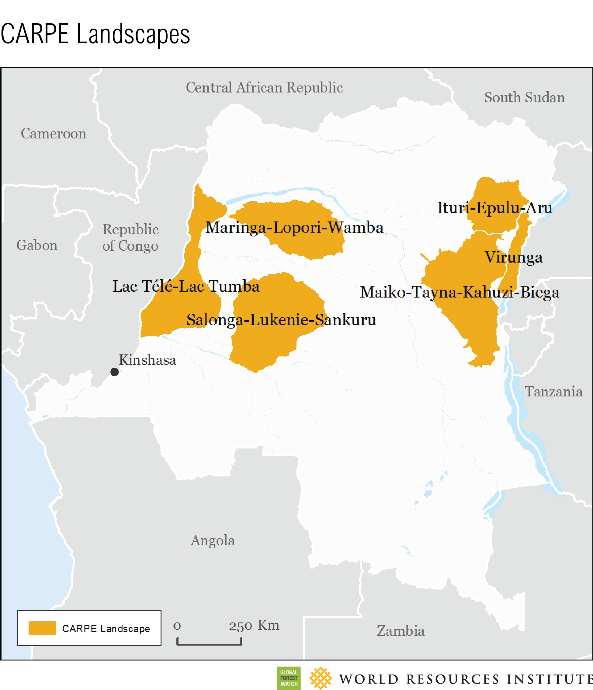 CARPE is a US Government long-term effort to sustain the ecological integrity of the second largest tropical humid forest ecosystem in the world – The Congo Basin. CARPE has a rich network of implementing partners, including WWF, WCS, WRI, AWF, regional institutions such as COMIFAC, local NGOs, universities and federal agencies including the Department of Interior, the U.S. Department of Agriculture (U.S. Forest Service and the Foreign Agricultural Service), and the National Aeronautics and Space Administration (NASA).